So you’re not at Monte Carlo; this Niagara Club Chair by Howard Miller will make you feel as if you are! Classically French in style with beautiful bandy legs and carved arms, the Niagara Club Chair is finished in distressed Rustic Cherry. 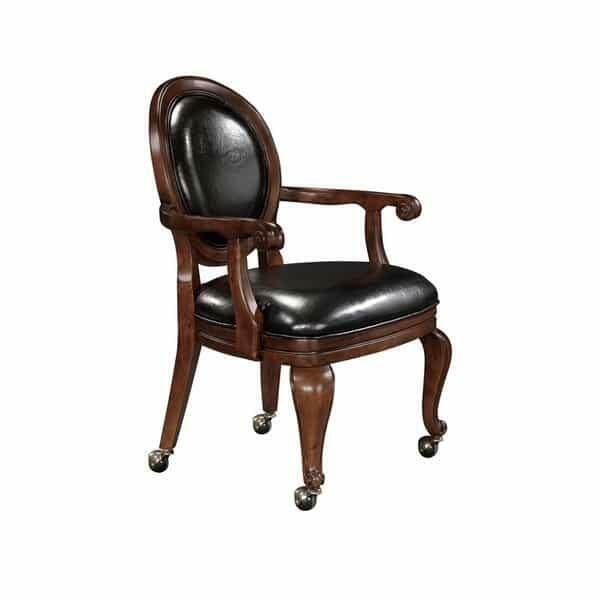 The Niagara Club Chair has a black faux leather seat and back, with plenty of cushion for an all-night game of Baccarat and it glides smoothly on four ball castors. It is a perfect complement to the Niagara Pub and Game Table (699-013). Call “banco!” – The Niagara Club Chair by Howard Miller is a sure winner.